Hello to the community! 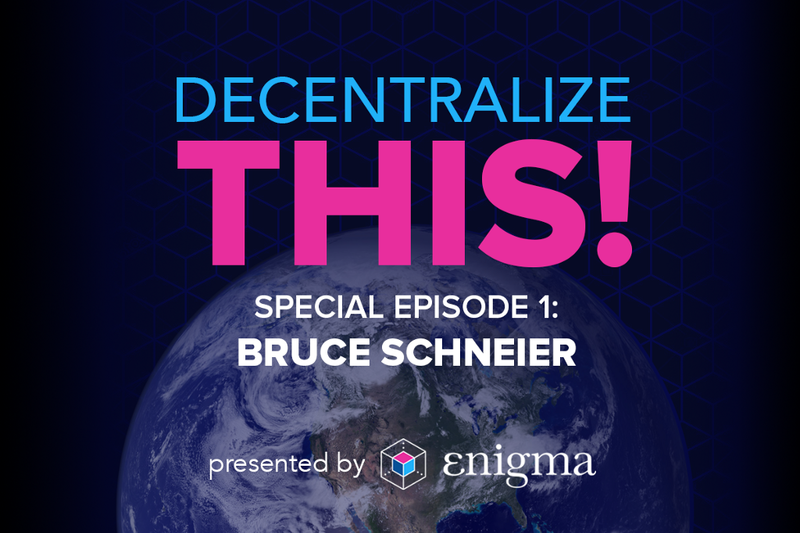 We’re proud to share the first special episode of Decentralize This!, Enigma’s podcast hosted by Tor Bair. Today our guest is Bruce Schneier. Bruce is one of the world’s foremost security experts and researchers, having authored hundreds of articles, essays, and papers as well as over a dozen books. He is a fellow at the Berkman Klein Center for Internet & Society at Harvard University, a lecturer in Public Policy at the Harvard Kennedy School, and a board member of the Electronic Frontier Foundation (EFF), AccessNow, and the Tor Project. His latest book, “Click Here to Kill Everybody,” explores the existential threats we’ve created by hyper-connecting our modern world — and how governments and people can move to protect our future, before it’s too late. Going beyond our regular interviews, special episodes will highlight important global issues and the leaders who are dedicated to solving them. For people building and scaling adoption of decentralized technologies, it is critical to understand the real problems and threats our world faces — the “Why” that helps define our “What.” Why is it so critical that we build the right things and scale them the right way? What about the world must we work to change? On this important episode, Bruce talks with Tor about new kinds of threats to our physical security, who bears the cost of these risks in society, why breaches like Equifax are only just the beginning, and what meaningful policies could help us to prevent catastrophe — if we move quickly.